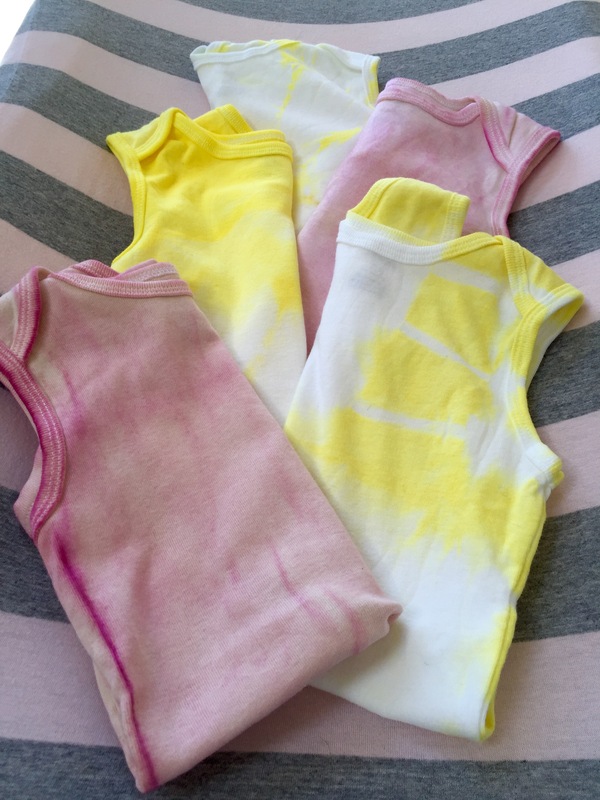 Using tumeric and beets I was able to make homemade natural dyes to tie dye these cute little onesies for my baby! It was a fun and easy project. The only thing that took time was letting the dyes soak in which took some patience because I was so excited to see he final outcome! I did the tumeric first. I peeled about a handful of tumeric and placed it in a pot of water to boil. At the same time in another pot I combined white vinegar with water (about 1/3 vinegar to water ratio). 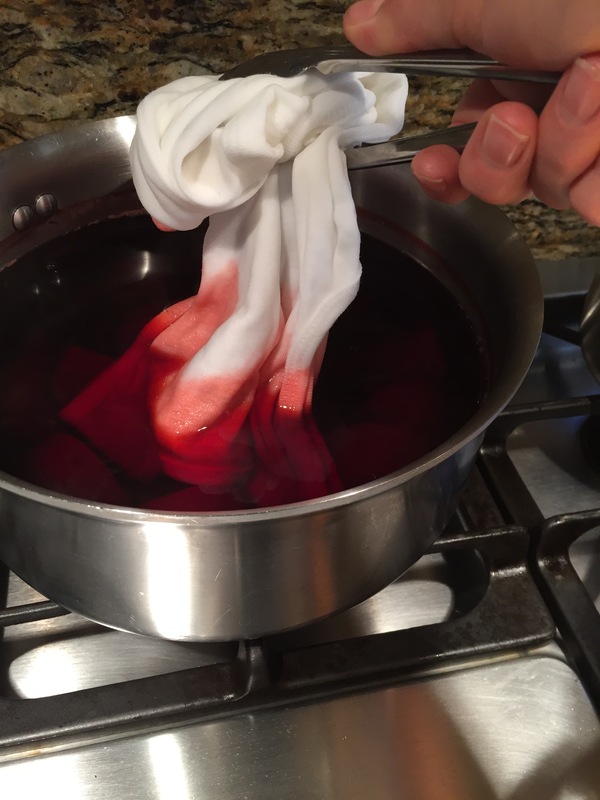 The vinegar helps the color hold in the fabric. While the pots warmed up I folded one of the onesies in an acordain style, first lengthwise then the other way until I was left with a perfect little square. I used a few rubber bands to secure the shirt. For another I pressed the shirt flat with my hands on the counter. 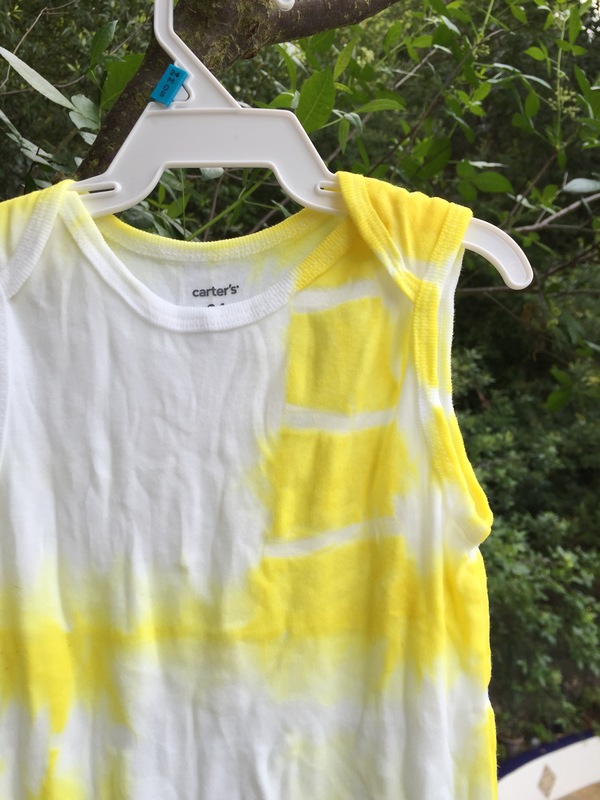 I pinched the fabric in the center of the top of the onesie and twisted it to make a spiral pattern on the front of the shirt for an old school tie dye pattern. When the whole shirt was in a spiral I secured that one with rubber bands as well. The third onesie I dip dyed the top portion in the tumeric. When the vinegar water was hot I turned off the heat and let the onesies soak while the tumeric pot boiled. I turned the flame on low on the tumeric water and let it steep for a couple hours so the color would become very rich. 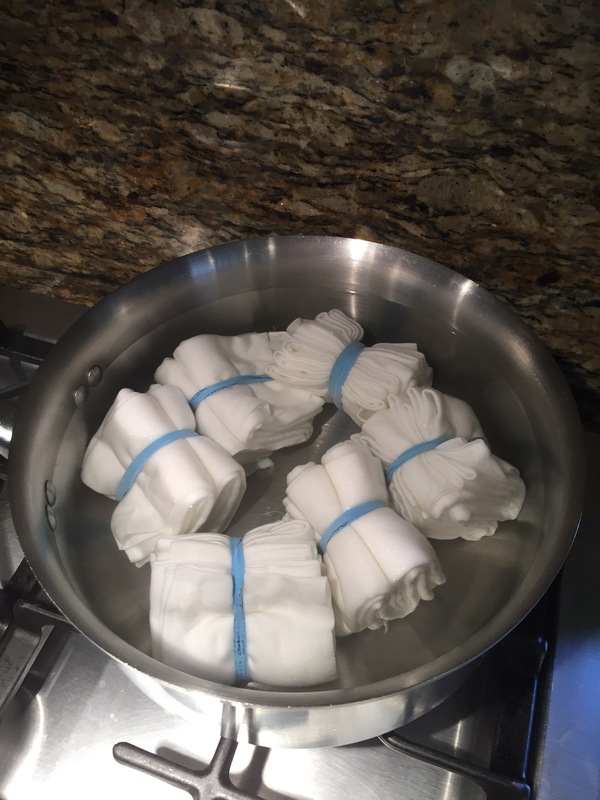 I also did a batch of acordain folded napkins secured with rubber bands. 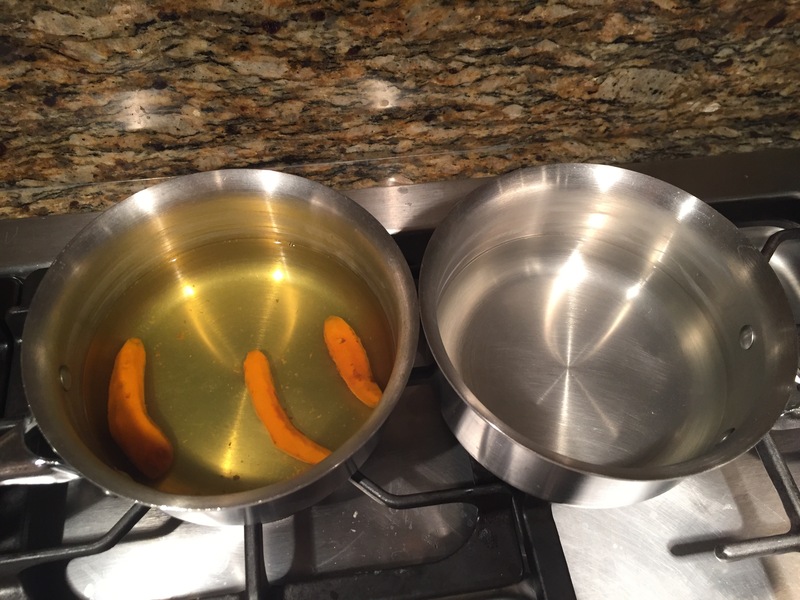 Here’s what those looked like soaking in the vinegar water: Once the tumeric water was very dark orange I started the process! 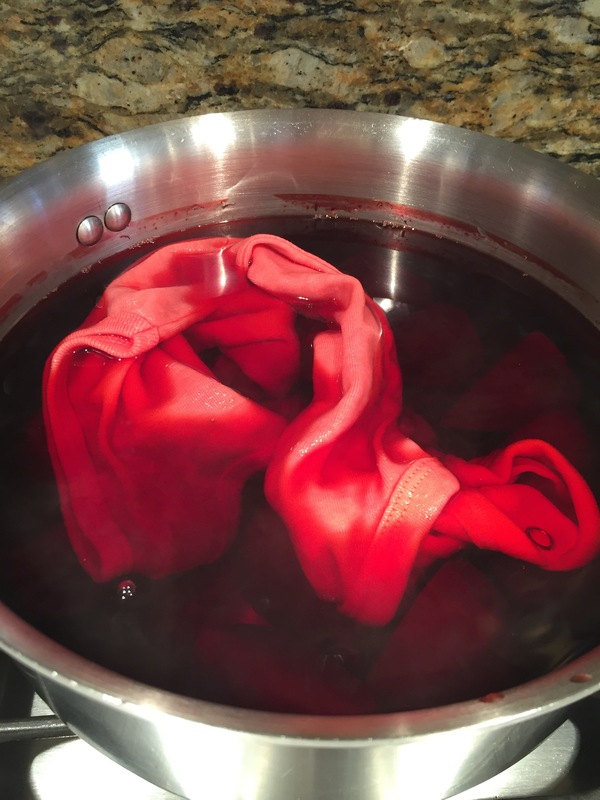 I placed the folded and rubber banded onesie in the pot with the dye and submerged them completely. I dipped the top of the third onesie in and let the rest of it hang out the side so it wouldn’t get any dye on it. I made sure the flame was off on the stove and just let them sit for a couple of hours! When I unfolded them I was so excited! The color stayed really well on these even after washing. 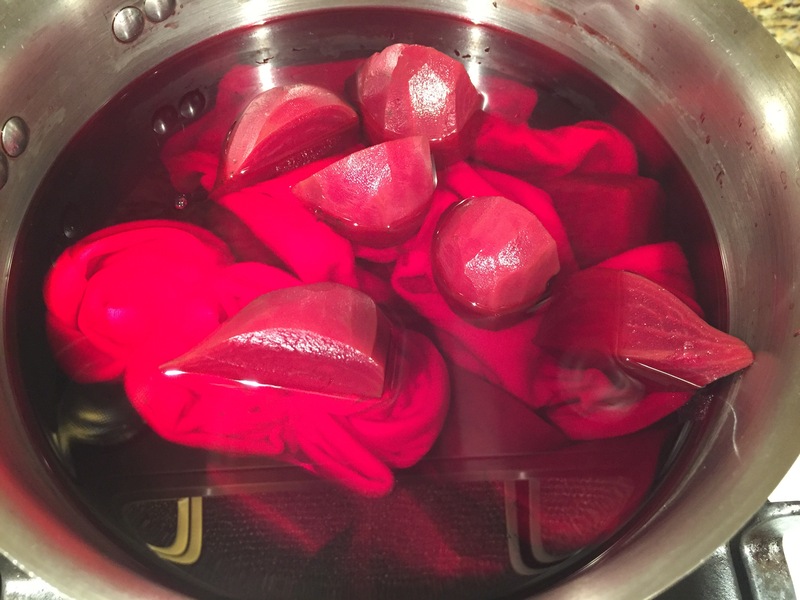 I saved the vinegar water and a few days later I tried the beet dye. It was a very beautiful color: I repeated the process as before and had fun rubber banding and dip dying these as well. 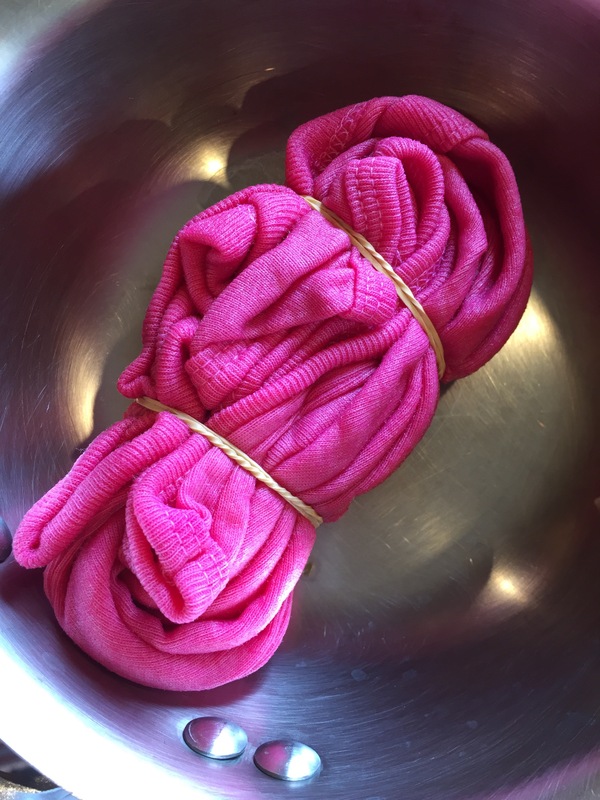 When they were all done I washed them (the tumeric ones first and the beet ones next–separate from all other laundry so as to not stain anything) on a gentle COLD cycle with mild detergent. 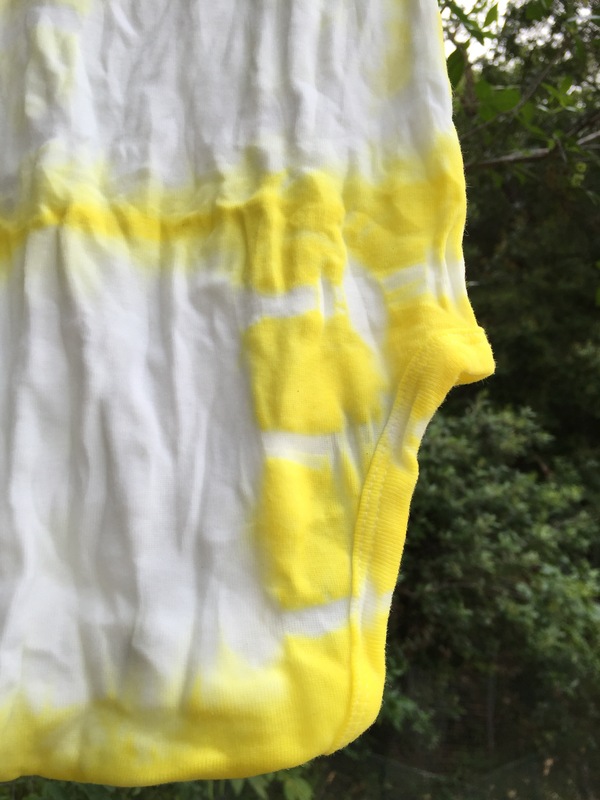 The color in the tumeric dyed onesies stayed! They look amazing.